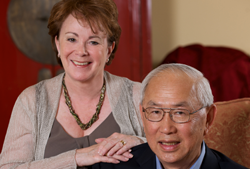 Van C. Mow, a member of the National Academy of Engineering (1991) and the National Academy of Medicine, and his wife, Barbara, have designated both academies as beneficiaries in their estate planning. "We want to leave something behind and contribute to some of the institutions that made me who I am today," said Mow. Q. Why did you decide to support the NAE and NAM with a planned gift? Both academies are dedicated to doing good for the country, and the world, by providing authoritative expert service on complex issues facing our society, nation and the world. We want to help to ensure that the NAM and NAE have the financial resources to enable this important work to continue. Q. What is important to you about the work of academies? The process of selecting members ensures that many of the very best people in engineering and medicine are elected to the NAE and NAM. They then provide their expertise to the academies in service to the country. These people volunteer their time, not because they are getting some remuneration in return. It's an altruistic endeavor. I am glad that my wife Barbara and I are in a position to help the NAE and NAM. The academies should be able to depend on its members and to draw upon them for support. Q. What are your favorite memories about being a member? Being a biomedical engineer, I was fortunate to have been selected to serve for many years on the Standing Committee on Aerospace Medicine and Medicine of Extreme Environments. This committee's assignments allowed me to observe the shuttle launch at the Kennedy Space Center, [and] to visit the Johnson Space Center where the shuttle, orbiter and the space station were being built in the hanger. As memorable, we have met many talented and interesting new colleagues at the NAE and NAM, and have made some meaningful friendships.